This week, we have another example of why caddies should spend more of their spare time familiarising themselves with the Rules of Golf, Local Rules and Conditions of Competition. On Friday, popular Italian golfer, Edoardo Molinari, was disqualified from the European Tour's Shenzhen International in China, following a penalty incurred by his caddie, who hitched a short ride on a golf cart between the 9th and 10th holes. 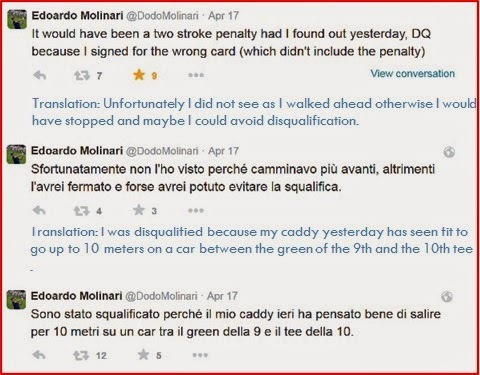 The caddie’s action incurred a penalty of two strokes (Decision 33-1/9.5), but Molinari was not aware of what had happened and returned his signed score card to the Committee, without including the penalty that had been incurred. This resulted in his later disqualification for returning a score card with a score for the 10th hole lower than was actually scored, due to the omission of the penalty. Equipment includes a golf cart, whether or not motorised. Players must not ride on any form of transportation during a stipulated round unless authorised by the Committee. This condition applies to most tournament events and all players are aware of the restriction, Of course, exceptions have been allowed where a player has a valid medical certificate for a disability that prevents them from walking the stipulated round. I have seen many comments from golfers who suggest that the Rules are too complicated and that in cases like this, a player should not suffer for the fallibility of their caddie, particularly when they are not aware of it. So, I want to point out how fallacious this suggestion is. If there was no Rule that penalised the player for their caddie’s actions, when a Rule of Golf was breached, the caddie would be able to remove loose impediments lying close to a ball in a bunker, tap down a spike mark on an intended line of putt, hold back the branch of a tree interfering with a comfortable stance, etc. Obviously, if there was an attempt to list what a caddie may and may not do regarding the Rules, it would require additional, unwelcome detail, making the Rules more complicated, not less. It has taken over 250 years to refine the Rules of Golf to where they are now, dealing with every conceivable situation; it is not easy to simplify them, though I know that the Ruling Bodies are constantly trying to do so. I want to take this opportunity to ensure anyone who purchases any of my eDocuments between now and the end of the year that they will receive a free update in January 2016, including the changes to the Rules of Golf that will become at that date (you will not receive that deal from Amazon/Kindle!) Click here to learn more about my range of eDocuments, written in a way that will assist players of all abilities to obtain a better understanding of the Rules of Golf. The specimen rule states "Players must not ride on any form of transportation...". Since "caddies" are not "players", how can this rule extend to caddies? If the ball lies anywhere other than on the putting green and the removal of a loose impediment by the player causes the ball to move, Rule 18-2a applies. Thanks for the tidy response. It is helpful to see that there are indeed other rules that extend to caddies when the term "player" is used, and in general I agree with this convention and see its necessity. However, there are occasions where players and caddies are NOT interchangeable within the rules. For example, "Rule 20-2. DROPPING AND RE-DROPPING: A ball to be dropped under the Rules must be dropped by the player himself." Since the right to drop does not extend to caddies, the extension of "player" to "caddie" is not universal, unfortunately. In this case, I think that since the extension was not made explicit in the specimen rule, in equity, the player should not have been penalized (and accordingly the specimen rule revised to provide explicit guidance on caddies). Then again, nobody asked me for my opinion!